Named after the phenomenon in which simulation of one sensory pathway elicits another sensory experience, Synesthesia is an abstract representation of how music travels through space. It uses sounds and colors to connect with participants, allowing them to simultaneously generate involuntary emotions and reactions. This installation celebrates the manifestation of sensory feelings and aspires to create an ambiance of diverse perceptions. Synesthesia was selected as one of the 25 finalists for the 2018 Baltimore Light City Festival held at the Inner Harbor/downtown Baltimore over the 8-day festival, April 14-21. Synesthesia installation was located in front of the popular Hard Rock Cafe. 442,500 visitors were able to experience Synesthesia, take selfies, dance and enjoy involuntary emotions produced by the effects of the installation. 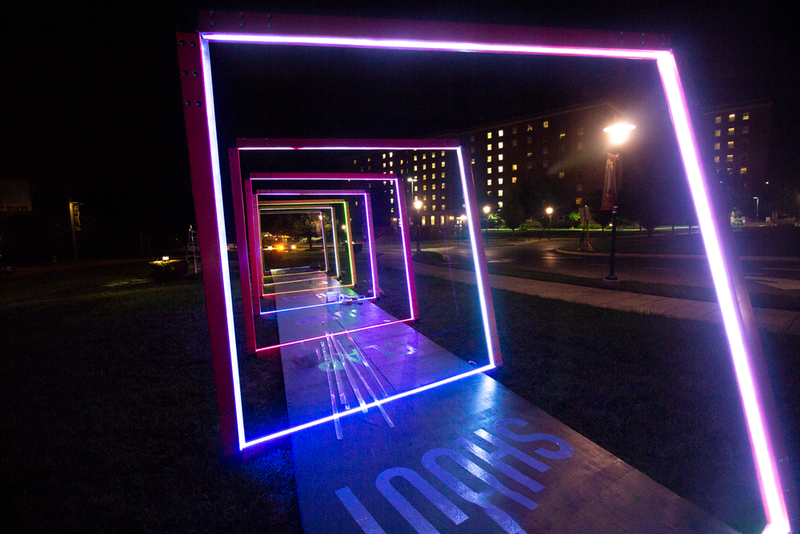 After Synesthesia’s success at the Baltimore Light City Festival, The Clarice Performing Arts Center at the University of Maryland requested to have Synesthesia for their annual NextNOW Festival, September 7-8.